Background: Breast cancer is a major cause of death among women worldwide. Treatment for breast cancer involves the surgical removal of cancer tissue, followed by chemotherapy. Although the treatment is efficient, especially when the cancer is detected early, recurrence is common and is often resistant to the previous treatment. Therefore, a constant search for efficient and novel drugs for the treatment of breast cancer is mandatory. Recently, triazole derivatives have shown promising effects against different types of cancer, revealing these molecules as putative anticancer drugs. Experimental: We have synthesized a series of naphthotriazolyl-4-oxoquinoline derivatives and tested their activity against a human breast cancer cell line. 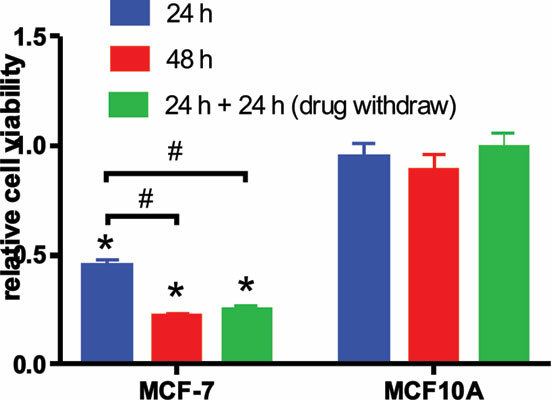 Among the compounds tested, we identified a molecule that killed the human breast cancer cell line MCF-7 with minimal effects on its noncancer counterpart, MCF10A. This effect was seen after 24 hours of treatment and persisted for additional 24 hours after treatment withdrawal. After 1 hour of treatment, the compound, here named 12c, promoted a decrease in cell glucose consumption and lactate production. Moreover, the cells treated with 12c for 1 hour showed diminished intracellular ATP levels with unaltered mitochondrial potential and increased reactive oxygen species production. Additionally, apoptosis was triggered after treatment with the drug for 1 hour. All of these effects are only observed with MCF-7 cells, and not MCF10A. These data show that 12c has selective activity against breast cancer cells and is a potential candidate for a novel anticancer drug. Results and Conclusion: The naphthotriazolyl-4-oxoquinoline derivatives were obtained in good to moderate yields, and one of them, 12c, exhibited strong and selective antitumor properties. The antitumor mechanism involves inhibition of glycolysis, diminished intracellular ATP levels, induction of ROS production and triggering of apoptosis. These effects are all selective for cancer cells, since noncancer cells are unaffected, and these effects can only be attributed to the whole molecule, as different pharmacophoric groups did not reproduce these effects. Naphthoquinone, Lapachol, 4-quinolone, 1, 2, 3-triazoles, MCF-7, MCF10A.